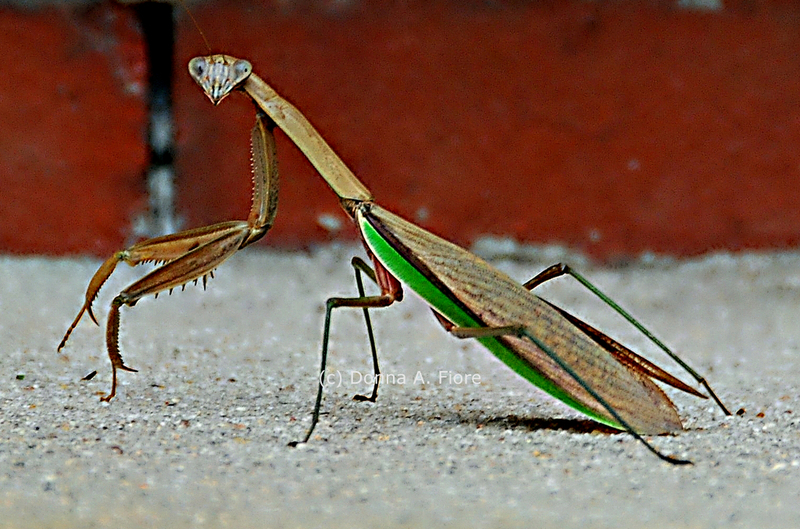 Photographed by Donna A. Fiore is a Praying Mantis. This Praying Mantis was captured using a Nikon D200 attached to a Nikkor 18-200mm f/3.5-5.6g IF-ED AF-S DX VR lens in the rural town of Lopatcong, New Jersey. The praying mantis (Mantis religiosa) is named for its prominent front legs, which are bent and held together at an angle that suggests the position of prayer. The larger group of these insects is more properly called the praying mantids. Mantis refers to the genus mantis, to which only some praying mantids belong. By any name, these fascinating insects are formidable predators. They have triangular heads poised on a long “neck,” or elongated thorax. Mantids can turn their heads 180 degrees to scan their surroundings with two large compound eyes and three other simple eyes located between them. Donna A. Fiore is a Brooklyn, New York born photographer recently relocated to the wilds of western New Jersey. A Performing and Creative Arts major, she was encouraged by her parents to pursue photography and now utilizes this art to share with others the beauty nature has to offer. As always, beautiful photos. Great information too. Amazing photo. I like the info as well. An absolutely amazing photo…I love the detail.